MANCHESTER UNITED MIDFIELDER Marouane Fellaini will reveal a decision over his future on Sunday, saying there is “no need to wait until the end of the World Cup”. The Belgium international will become a free agent on 1 July if it transpires that he has not signed a new contract at Old Trafford, and a move away from the club would bring his five-year stay in Manchester to an end. Fellaini has been a divisive figure among United supporters since being signed by David Moyes in September 2013, making just 16 Premier League appearances in his first season at the club. He enjoyed a brief renaissance under Jose Mourinho, playing 28 times in the top flight in 2016-17, but his opportunities were limited again the following season after Paul Pogba’s arrival. AC Milan sporting director Massimiliano Mirabelli said Fellaini could be a target for the Italian giants and the player did little to cool speculation over his next destination when speaking in Russia ahead of Belgium’s Group G match against England on Thursday. 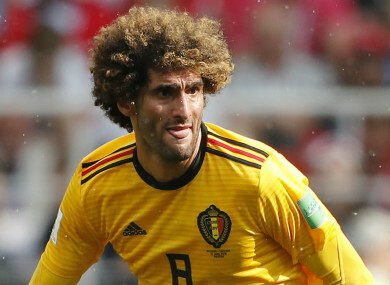 Looking ahead to his country’s final World Cup group game against the Three Lions, Fellaini suggested that his knowledge of the English game could give Belgium an advantage. Fellaini was an unused substitute in Belgium’s 3-0 victory over Panama, before featuring in the second half of the Red Devils’ 5-2 win over Tunisia. “If we want to go far in this World Cup we will need every player,” he said. ”Everybody is ready to play, everybody wants to play. “I know the Premier League very well and many England players also. I am proud that more Belgium players followed in Vincent Kompany’s and my footsteps and are doing great now in England. Email “Man United midfielder Fellaini sets date for announcement on future”. Feedback on “Man United midfielder Fellaini sets date for announcement on future”.